Another supplemented tree silhouette (like the last one). 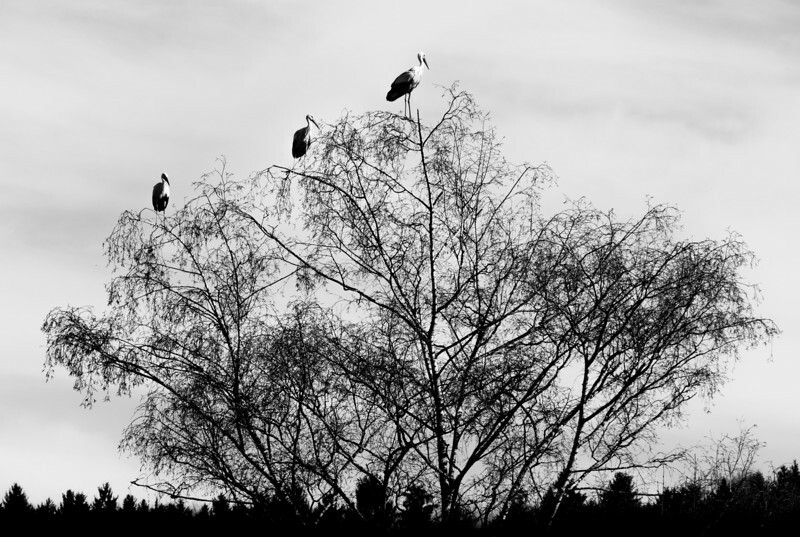 This composition features three storks that rest on a birch tree. The photograph was created in spring 2013 and seems appropriate today. We had a wonderful and warm weekend here in Zurich and I am looking forward to the warmth and awakening of spring. I wish you a good start in the new week! Digitalis purpurea in Redwood National Park, California, USA. My Flora-posts have been on hold for quite a while; a kind of extended hibernation. One reason is my laziness (these posts take much more time than short 1peeks for example), but I have also taken much less flower photographs during last year. This is not a good excuse because I have plenty of older photographs that fit the Flora topic, but it reflects my photographic interests at the moment. However, every year when spring approaches, I become sensitive and interested in flowers, which manifests itself in my urge to photographs flowers and to sow flower seeds for the coming spring and summer. Last year, I particularly envisioned photographing flowers during our long summer holiday in California, Oregon and Washington State - however, I became engaged in a different theme and captured only few flowers. One of these exceptions was the purple foxglove, Digitalis purpurea, shown above. Even though we saw foxglove repeatedly along our journey, we learned that it is actually not an indigenous species in the United States at all. The foxglove is native to Europe and is considered an invasive and noxious plant in the US. The Latin name of the foxglove, Digitalis, refers to the finger-like shape of its flowers and the genus Digitalis belongs to the family of the Scrophulariaceae (figwort family). This group of plants bears the German name "Rachenblütler", which, literally translated, means "throat flowers". In my opinion this is a fitting name for these beautiful flowers. The foxglove is an extraordinary and important plant in different aspects. Its deceivingly beautiful flowers and also the seeds are highly poisonous and cause nausea or even hear failure and death. However, at the right dose the active compounds of Digitalis, the cardiac glycosides known as digitoxin and digoxin, support heart function and are used in medicine. Furthermore, the compound digoxigenin (DIG), also found in Digitalis species, is widely used in molecular biology laboratories to detect DNA and RNA. Finally, the foxglove is a popular ornamental and the cultivated varieties with flowers in all kinds of colors are much more common than the rather rare wild species. The photograph above switches between two versions - one focused on the front of the flower and a second photograph with the focus inside the flower. I think this is an illustrative example of how a subject changes by moving the focal plane just a tiny little bit. If you want to look at the original photographs, have a look HERE. I hope you enjoy! 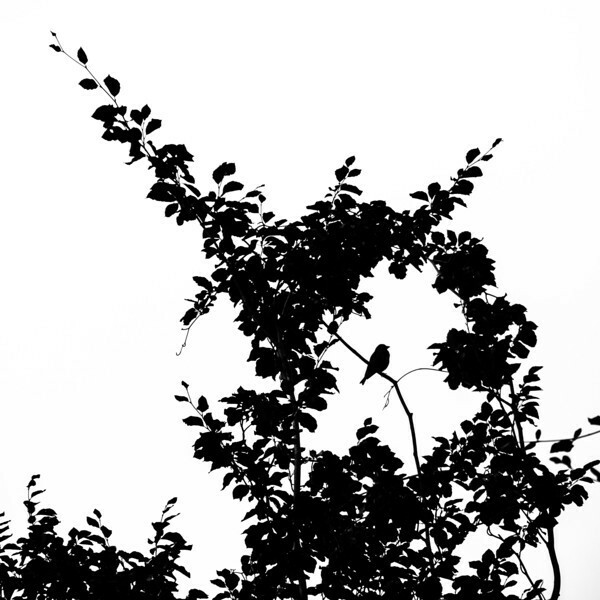 Today's tree silhouette comes with a supplement - a bird silhouette. I was debating whether I should start a whole new gallery entitled "tree silhouettes with birds", but decided against it. In the photograph above I like how the bird is framed by the beech branches; almost as if it was sitting in a cage. Like most of the tree silhouettes shown here, it is also a nearby photograph. The composition above was taken at our children's school, where a whole "forest" of purple beeches has been planted (it does not resemble a forest at all, the trees are still rather small). If you are interested, have a look at some of the tree silhouette photographs shown earlier or at the tree silhouette gallery on Florian's photos. I have not forgot to print my January photograph, but I am one day late with my posting about it. 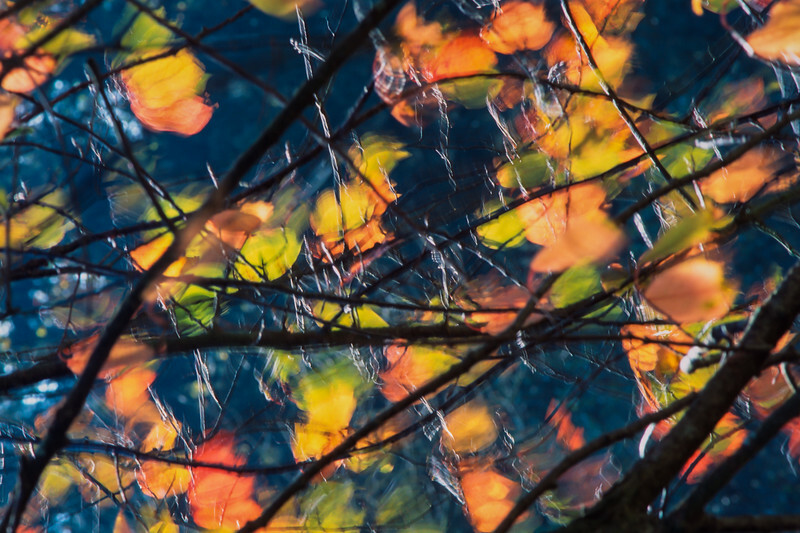 I have already shown these flittering cherry leaves, a long time ago, but now I have "officially" printed it. It is a photograph that I have taken when I was still in school, with my first "real" camera and my first zoom lens, and it is still a capture that I like and am proud of. I hope some of you like it too. If you find any photograph on my site that you would like to receive as a print, let me know and I will print it for you in February (and you will receive it for free).